Specialising in household credit, Findomestic was formed as a finance company in 1984 on the initiative of French and Italian credit institutions. Since then it has helped improve its customers’ quality of life, enabling them to fulfil their desires, providing customised consumer credit products and services. Findomestic operates in the sector of personal credit for the purchase of goods and services, and provides loans through the following sales channels. Affiliated Commercial Operators: commercial operators to which Findomestic Banca offers resources and technologies for providing consumer credit directly at the sales outlet, quickly and easily. 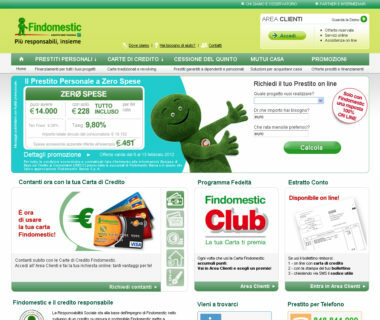 Findomestic Banca Customer Centres: centres distributed throughout Italy, offering credit aimed at private customers via telephone, mail or directly, at the offices. Banks, Insurance Companies, Service Companies: partners who use the credit services made ​​available by Findomestic as a strategic tool for customer retention. Network agents of Findomestic Network S.p.A.: offer their customers all Findomestic Group products such as personal loans, loans for the purchase of goods and services, mortgages, car leasing, credit cards and salary-backed loans. Internet: a channel that provides institutional information about the company and its products, and gives access to consumer credit online.